Do You Already Have A Campsite? Do you already have a campsite but would like to upgrade? We have a wide range of beautiful & robust cabins. 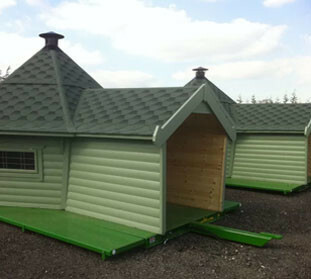 Our buildings stand out from the crowd in your campsite and can be designed to any specifications your business needs. Rain or shine, your guests will love to glamp in one of our camping cabins. We ensure your customers get a unique and memorable experience. There are multiple things to consider when you're setting up a new campsite. One of these being planning permission. When it comes to planning permissions and licences for camping cabins, pods and facilities the best advice we can give is to do your research. We are here to help you get your new campsite set up, we offer a multiple range of services including a starter checklist. Read the story behind Chester Lakes and how Camping Cabins helped them satisfy planning regulations on their historic campsite. Camping CabinsTM supply quality, attractive log cabins and Glamping pod arches that are suitable for businesses looking to add a little glamping experience to their campsite. We can also help with luxurious timber washroom buildings for your guests. Our campsite buildings come in a variety of shapes and sizes to attract couples, families and large groups to your campsite. Our range of buildings will help you stand out from the crowd! Whether you want to offer a quirky, unique experience in Scandinavian inspired Cabin. An upgraded glamping experience in our super sized XL Glampers. Or, a home from home experience in an Annex style lodge – we’ve got a building for your business needs.